Often touted as the world's best pilsner, Rothaus Tannenzapfle is indeed a stunning example of clean, delicious lager brewing. 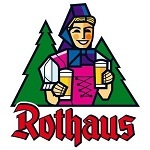 The brewery itself was founded by the abbot of a monastery in the German Black Forest. It was meant to bring prosperity to the region, and has done exactly that. Being entirely state owned after the abolition of the monastery it donates millions every year to the state, while producing near enough 1m hectolitres without ever compromising its world-famous flavour.